Buy now with Free Shipping!!! Please click the link below. Inspired by one of the most popular and widely carried folding knives ever made—the Para Military™ 2—Spyderco’s Para 3 proves that less can be more. It distills all the proven qualities and design features of the best-selling Para Military 2 into a more compact, scaled-down platform ideal for everyday carry. 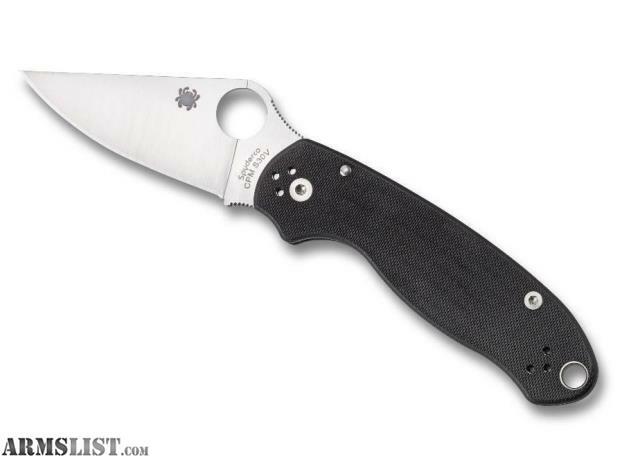 The Para 3’s full-flat-ground CPM®S30V®stainless steel blade measures exactly three inches, providing plenty of blade for even the toughest cutting chores while making the knife both convenient and legal to carry in most areas. The blade’s signature Trademark Round Hole™ allows quick, positive, one-handed opening with either hand, while its textured index-finger choil and thumb ramp ensure enhanced control during precise cutting tasks. Slim and pocket friendly, its lightweight, open-backed handle features stainless steel liners nested into machined recesses in the textured G-10 scales. This minimizes handle thickness and provides excellent structural support for the knife’s high-strength Compression Lock™ mechanism. A four-position hourglass clip and an oversized lined lanyard hole complete the design, offering ambidextrous tip-up or tip-down carry and allowing the easy attachment of fobs and lanyards.